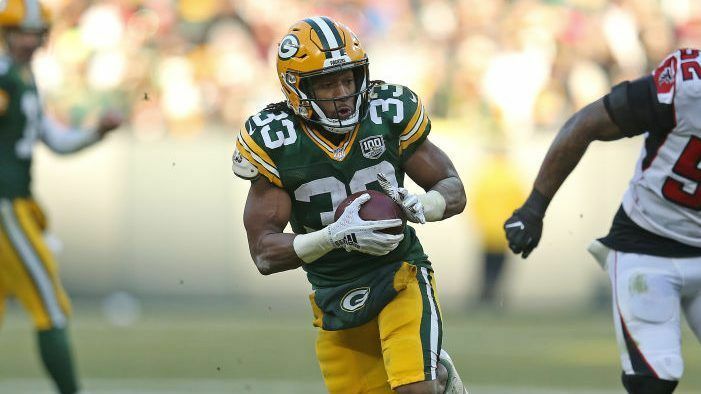 The Green Bay Packers announced they placed running back Aaron Jones on season-ending injured reserve Tuesday because of a knee injury suffered in Sunday’s Week 15 loss to the Chicago Bears. Green Bay signed wide receiver Allen Lazard off the Jacksonville Jaguars’ practice squad to fill the void on the 53-man roster. Jones had scored at least one touchdown in five consecutive appearances before leaving the game against the Bears in the first quarter. He didn’t return to the contest. The 24-year-old UTEP product finishes the season with 728 rushing yards on 133 carries (5.5 YPA) with eight touchdowns. The fifth-round pick in the 2017 draft added 26 receptions for 206 yards and a score. Jamaal Williams should lead the Packers backfield for the final two games of the 2018 season. Lazard signed with the Jags after going undrafted out of Iowa State in April. He re-signed with the team to join the practice squad when he didn’t make the final roster. He made 241 catches for 3,360 yards and 26 touchdowns in 48 games across four years with the Cyclones. He’ll provide receiving depth for Green Bay following a rash of injuries at the position, including Randall Cobb entering the concussion protocol after Sunday’s game. Jones sustained two knee injuries last season as a rookie, both MCL sprains. He said he believed this injury was similar. The Packers were eliminated from playoff contention on Sunday. Jones was suspended without pay for two games for violating the NFL Policy and Program for Substances of Abuse on July 3. The suspension stemmed from an early October 2017 arrest and a marijuana-related charge, to which he pleaded no contest in February.